Its been a while since ive been online for various reasons, but im still doing some work with flare. When I have the time, I have been working on a new mod. It still needs a lot of work before it will play like real game but theres enough done to get the gist of the what im trying to do. 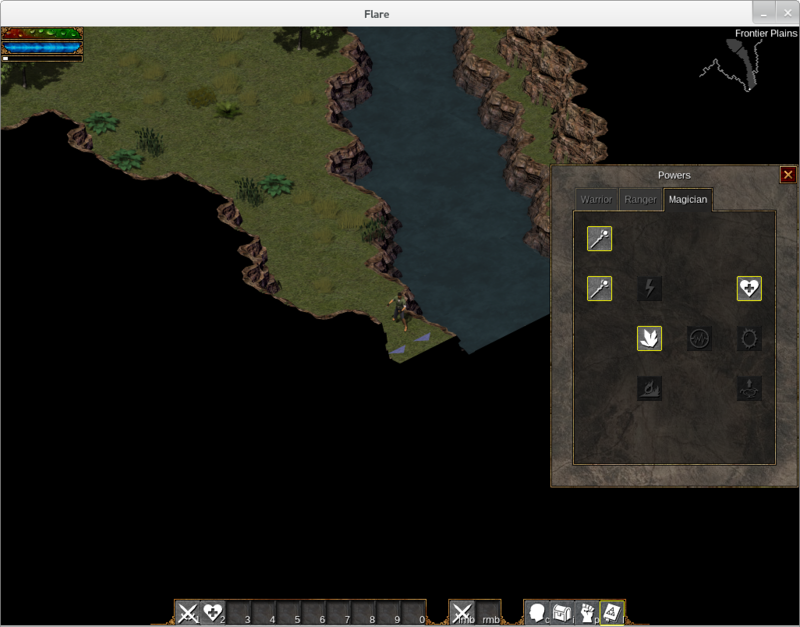 A lot of the map, player powers, npc and enemy work is done. Theres plenty more work to be done on enemies, maps and loot. Although I was trying to create a mod to work with the existing engine, theres also a few programming tweaks needed. I have uploaded the files to a new git repo at the below address. The mod also requires the fantasycore and alpha demo mods. The basic goals are to create a small game which will work on the v1 flare engine, which can be called complete with an achievable scope, which shows off some of the newer engine features and shows off some of the previously unused flare art from opengameart. The current files include all of the flare ready enemy graphics submitted to this site, including the nice work recently submitted by VWolfdog. Compared to the alpha demo, i have tried to focus a bit more on character development. Leveling is much quicker and goes higher. Theres a slightly different approach to player powers, allowing the player to invest multiple skill points to improve a power. The powers may appear to be over powered but this is intentional and will be offset with more powerful enemies and greater quantities. The plan is to also 'unlock' new powers after completing certain quests. So the powers would not all be immediately available at the beginning of the game. 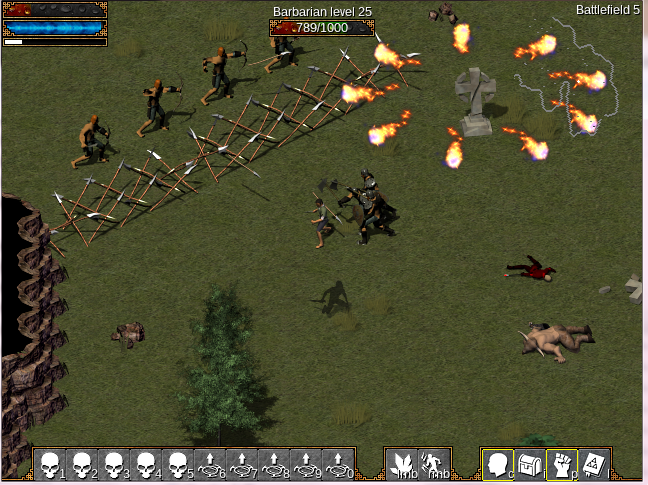 After the main game content, the player can go to the alpha demo maps where the enemies will be beefed up as appropriate to the player level. The current 'unknown location' areas will be replaced with areas containing uber bosses to tackle after completing the main game. At this point, im hoping that somebody might want to join me on this and work on the mod together. If anyone is interested, I would be happy for them to take control of specific parts of the mod e.g. map development or eqipment. If anyone is interested, please let me know. Awesome! More content is always welcome. Earlier today, I started work on polishing the current alpha demo. One of my original goals (aside from redesigning the Frontier Plains) was to close off all the "Unknown Destination" spots, since they confused newer players and no modders were using them. I'll probably skip that task now, to avoid breaking compatibility with your mod. I could do transaltion to the Czech language. I am currently translating f.e. freekick.org (football manager), or some stuff for ubuntu ... anyhow, good work, if I were better with the code, I would participate too. Socrates - "There is only one good, knowledge, and one evil, ignorance." Sounds like a great idea! I like the focus on levelling up, that's something I've wanted to do several times myself- I just couldn't figure out how to work it all together. Also find me on RPG Toolkit <a href="http://rpgtoolkit.net/member/vwolfdog/">here</a href>. urgulak: That would be good. I will post on here when the mod is closer to completion. VWolfdog: Thats awesome. I have tried to build the mod to rely only on the existing graphics but there are of course a few areas which could use some more art. Below are the main art jobs. Anything contributed would be greatly appreciated. If you do decide to work on something, or if you just want to see your existing art in action, let me know if you need any help with getting the mod to run. 1. One of the player powers is a tower which appears for a few seconds and shoots fireballs at your enemies. This would be implemented as a spawn power so the art would need to be enemy graphics. The tower can shoot in one direction or at later levels in 4 or 8 directions, spread out evenly. Since its a tower, it could probably work with a single frame for stance and a die animation. A spawn animation would be a bonus. 2. The current "Stealth" art is used for an Assassin enemy in the battlefield maps, however it doesnt have any "die" animation so just stands there after its defeated. 3. A lot of the player powers dont have any appropriate icons so just display the default ? icon. 4. (COMPLETE) The quest items: apple, wyvern tail and fire antlion heart dont have appropriate item icons. Of course the names of the items can be changed if required to match some available art. 5. (COMPLETE) On one of the battlefield maps will be a "barricade" enemy which is just a static object that doesnt attack but blocks the players way until it is destroyed. This will be surrounded by archers which will shoot the player while he is trying to destroy the barricade. Just like the fire tower, it probably just needs a single frame stance and a die animation. I was thinking that something from one of the tilesets could be used for this, but of course it would be missing the "die" animation. 6. (COMPLETE) "effect" art for the "fear" effect. Its currently using the bleed animation. 7. (COMPLETE) I think that the Werebear art is a lower quality than the other art used in the mod. Specifically I think that the animations are a little wooden and that the texture is a bit too glossy. http://opengameart.org/content/werebear-flare-sprite-sheets. These sound very do-able. I can post the art on OGA and post links to them in this thread? Or would you rather me upload them elsewhere? @ryan.dansie how do I know if I'm playing your mode or not ? From what I have understood (so far) for any mod to work with the flare-engine, I have to do two things. a. Pull the latest from flare-engine master and compile it. b. Then copy flare and all the directories under mods/default/ with the same name in whatever game/mod I'm playing. I did the same herein as well, and in the configuration screen it just shows the same things as before i.e. 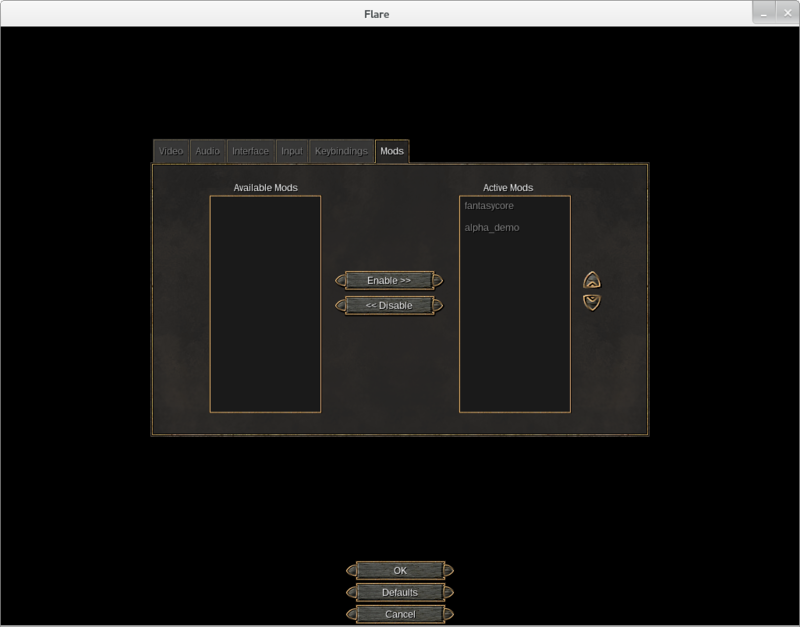 fantasycore and alphademo. I read the readme and didn't see any difference between the README listed here as well as flare-game. Maybe I did something or some mistake. If yes, please share what ? VWolfdog posting them on opengameart is fine. They look great thanks! I have added them to the mod. Ok, I have looked, that the czech transaltion is already here: "https://github.com/clintbellanger/flare-engine/blob/master/mods/default/...", so if you have some new texts, you could just send me them f.e. by mail, in a format you want to have it back. Than I would like to test it, beacause of some special czech symbols, that could do problems. Okay, I've got some barricades done: stone and wood. If you needed more kinds/different kinds just let me know. What were the player powers you needed icons for? urgulak: Thanks I will post in the forum when the mod is ready for translation. VWolfdog I have gone through the power icons again and assigned icons to each power from the existing art. Most of the power icons are not bad now but there are four powers which still dont have icons with any relevence. They are Summon Goblin, Summon Wyvern, Werebear and Werewyvern. 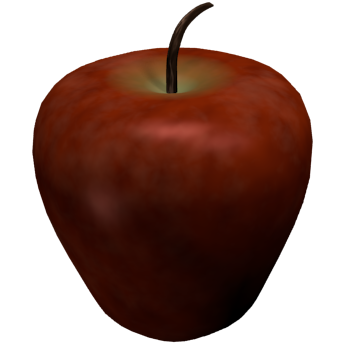 Okay, I've got the apple done. 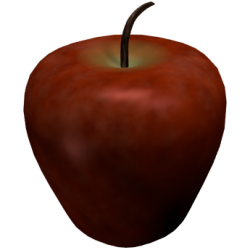 Here are a 32x32, a 64x64, and the original render, in case you need it. Very nice thanks. Its added to the mod. @ryan.dansie . What would you require so that flare-game is not referenced at all and just whatever is needed can be used from flare-engine to play your game ? jeremyW Thats the great thing about this site. And the Flare art is one of the more consistent styles available. Very much looking forward to your upcoming game by the way. It sounds like a great idea. 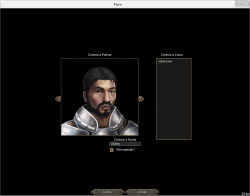 A few of the flare developers have dreamed of a multiplayer version of flare so it will be good to see the art used in a multiplayer game. shirish The required data from the fantasycore and alpha demo mods could be copied into the new mod but its easier to manage when kept in seperate mods. Once its ready for release I will make a windows package and im hoping that others will create packages for other OSes as they have done for the alpha demo. @ryan.dansie. Could you take that data and push it your repo. ? I have been unable to clone flare-game for quite sometime so would appreciate if you could pull it from flare-game and push it in the repo otherwise I can't play your game. shirish i have uploaded the required mods default, fantasycore and alpha_demo to my repo. No item sets were found. Another thing, you need to fix your readme. It is a copy of the flare-engine readme. Yours need to be more similar to the flare-game readme which is different and go on from there.You might wanna also talk about OGA in there. This should not be happening right ? shirish. Thanks for letting me know. Ill be sure to look at that. VWolfdog. Looks great. I have added it to the mod. Thanks for supplying the animation also. Do you still need tweaks to the werebear? I think I've learned a bit since I initially made it. I can see about making some modifications/improvements to my work for you if nobody has addressed your concerns yet. That would be awesome. I did replace the werebear skill with werewolf but the werebear is still used in one of the quests currently. I will probably use it for one of the uber bosses as well with the white and brown bear for a double boss fight. Thanks for sharing all your previous work also. The spiders and orc art is being used heavily in this game. The orc art in particular provided me with some overall inspiration and story/map direction for the mod. Here are some icons I made: Some may work for your summon moves, but a couple I just did while I was at it. I've got summon goblin, summon wyvern, summon antlion, and summon werebear. I couldn't figure out how to differenciate between werewyvern and regular wyvern. VWolfdog thanks for the icons. They have been added. I already incorporated Mumus werewolf icons. FYI the werewolf & werewyvern powers are transformation powers not summon powers i.e. the player shape shifts into wolf or wyvern. So perhaps the werwyvern icon could be some sort of wyvern/human combo. Maybe just a human head with a single wyvern wing. Not sure how that would look. I am not able to see the new powers. Attaching a screenie of the same. I would also suggest to have some sort of different look so it's easily distinguishable between flare-game and flare-mod-noname. As of right now it's only on the first run when our hero goes to the plains I see the message, otherwise looks wise till now no change. I've made some updates to the werebear. I tweaks the animations and added variations with "used to be a person" textures of torn clothing and armor. Feedback is quite welcome, as that's how I learn and improve. Very nice. Ill definately be able to do something interesting with these. Ill give you some feedback on it once I see it in game. Im having some technical difficulty with them at the moment so will have a look tomorrow. shirish if thats what you see then the new mod is not enabled. Your still seeing the alpha_demo. Below is what you should have in the "Active Mods" list after clicking on configuration button from the main menu and then on the mods tab. They need to be in the same order as this aswell. Below is what you should see when you first start the new mod. The maps and powers are completely different. And here's a go at the assassin. Feel free to be picky, if you want something changed I'd be glad to do so! nope, don't see new_game_mod anywhere in the configuration screen. so guessing something is missing but how or from where no idea. VWolfdog thanks. Unfortunately it doesnt quite suit the current assassin enemy. The assassin moves very slow and then deals big damage if it reaches you. The movement speed looks unnatural with this new art. Kind of like its moving in slow motion. With the existing stealth art, it has a slow creeping movement so it looks like its supposed to be moving slowly. I have added your new work to the mod and will use it for a different enemy instead. I like the unusual attack animation by the way. shirish in the git repository is a directory named new_game_mod. Copy this into your mods directory and then check the available mods again in flare. This is till the menu, this is regular stuff as have no joystick. I have put up the configuration as it shows now at my end as the attachment. When I try to run the game/play though, first there is only an adventurer class available (none of the other classes are available it seems) as can be seen in the other screenshot. 'You are defeated' this is without firing a single shot or doing anything . I have no idea how to debug this, any ideas ? I can build flare-engine with debugging symbols but dunno if that is alone enough to debug this, comments ? Okay; a slower, more creeping enemy is on the way! shirish im not sure what the issue is but maybe its an old version of the engine? The player stats definition changed a little while ago so maybe its not recognising the player hp stat. This would give you a max hp of 0 so would probably cause you to die as soon as you start the game. Are you building the engine from source or using the 0.18 engine from the flare website? Below is the link to the branch which im using for testing. Type 'git log' for more commits, or 'git show' for full commit details. so I probably would make another one and use yours. Now I've trouble checking out the branch, does anybody know what to do ? For e.g. this is what I get in ryan's repo. Branch ng_engine set up to track remote branch ng_engine from origin. Looking forward if I'm going the right way or the wrong way about this. and then compiled and copied the compiled .flare and the contents of mods/ folder. Hopefully this is correct. If it isn't please share the same. The re-animating the assassin will take a little longer. Is the model good by the way, it just needs different animations? Also with the horse, even if I do tame him and he follows to the town, can't do anything. On the other hand if I kill him, the guy is impressed and I can go to town. Something's wrong/buggy here. or maybe I just need conversion 2 to do with the horse ? shirish no need to worry about those log messages. It sounds like you have the game working now. The horse quest cant be completed by converting the horse yet because it requires a change to the engine. So for now you can complete the quest by defeating it. VWolfdog thanks for the new horse variation. I have added it to some warhorse enemies in the later maps. For the assassin, I think the "stealth" gfx are more suited to this enemy. I do appreciate the effort though and will use the above gfx for something else. shirish theres an exit on the east of desert 1 and at the north west of desert 2. The desert 1 east exit should be done first. Theres plenty more content left but theres no more quest logs beyond the goblin caves.